The rumors are real: American McGee is working on Alice: Madness Returns, a sequel to his original twisted take on Wonderland. These days, dark versions of Lewis Carroll's Alice in Wonderland are commonplace - but back in 2000, American McGee's Alice was something special. It resonated in gamers, sold over a million copies, and remains a very beloved dark and twisted take on a classic childrens' tale. It may be a year and a half after the initial rumors, but American McGee is indeed returning to Alice. Much of the original team - including the original writer - is returning for the title, which takes place 11 years after the original, following Alice's release from an insane asylum. 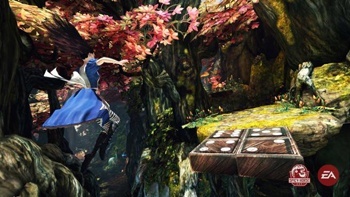 Alice: Madness Returns features the eponymous heroine using Wonderland as a psychological superpower of sorts to deal with darkness in her life, only this time the game will also take place in London as well as the fantastic world through the looking glass. We saw a brief glimpse of the game in teaser form, with Alice sitting in a psychiatrist's office. "Tell me about your Wonderland," says the doctor's voice - and then Alice opens her mouth, which starts gushing blood and teeth. The screen goes black, and someone asks: "Alice, what have you done?" If you liked Alice, this is definitely one keeping an eye on. Update: Aaaaand here's the teaser in question. It's creepy. It's the teeth, really.